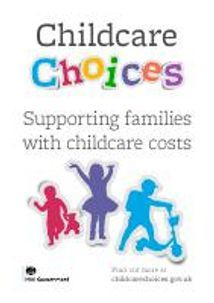 It has thrown up quite a few questions and how it differs from the current 15 hours childcare offer. Below we address some of those questions including how to sign up for the 30 hours offer. There is no requirement to work a certain amount of hours per week – it is all about how much you earn. This means if you only work 10 hours a week but earn £12 per hour, you will meet the minimum earning threshold. Apprentices are also eligible as long as they earn the equivalent to 16 hours at the apprentice minimum wage. This applies if you are self-employed or on a zero-hours contract and expect to meet the earning criteria on averageover the three months after you have applied for the 30-hours. HMRC will look at data such as your previous earnings to consider whether you are likely to meet the criteria and may contact you for further information if they are unsure. If you are starting up your own business, you will not be expected to meet the minimum earning criteria in your first year of trading. You will need to provide a Unique Tax Reference (UTR) number to HMRC so that they can check your income at the end of the tax year. 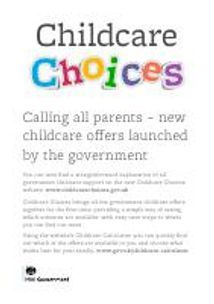 You will be able to apply for both the 30-hour offer and tax-free childcare using a single application available online via the Childcare Service. To complete the application, you will need to provide details such as your name, address and national insurance number, as well as whether you expect to meet the income requirements over the next three months and whether you are in receipt of any benefits. If you live with a partner, you will need to provide the same information for them as well. 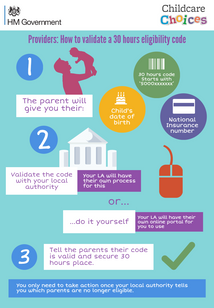 This will enable HMRC to decide whether your child is eligible for the 30 hours (as well as tax-free childcare). You will need to reconfirm your eligibility every three months and will receive a reminder text message or email from the government before the deadline. If you give false information about your eligibility, you could be fined up to £3000.